Most people don’t get their hair cut every four to six weeks, but there are many benefits to getting regular haircuts. #4. It keeps your hair healthy and low maintenance. When your hair is smooth and healthy, it’s a lot easier to take care of. That means that you’ll have to spend less of your time styling your hair before you go to school, work or out for the night. Imagine if you only had to spend five minutes doing your hair instead of 20. That 15 minutes could allow you to slow down and actually enjoy your coffee, catch up on the news, eat breakfast with your family, get a quick workout or a number of other activities that definitely beat doing your hair. #5. It maintains your style. Have you ever noticed how impossible it is to maintain that salon-fresh look for more than a few weeks after you’ve had a haircut? That is exactly why many stylists suggest getting your hair cut every four to six weeks. Not only does it keep your hair healthy, but it also helps you to maintain your look. This is especially true if you choose a shorter style. Your hair won’t grow uniformly, and split ends can cause frizz that will effectively ruin your look. But regular haircuts will ensure that your hair stays fabulous long after you get your initial cut. #5. It may even help you save money. The fact of the matter is that unhealthy hair is much more expensive to take care of than healthy hair. When your hair is unhealthy, it’s more likely to be frizzy, thin and flat-looking, and you may have to spend a pretty penny on styling products in order to make your hair look healthier. Additionally, when your hair is perpetually damaged, you’re more likely to spend big money on specialized shampoos, conditioners and masks in your attempt to combat the damage. 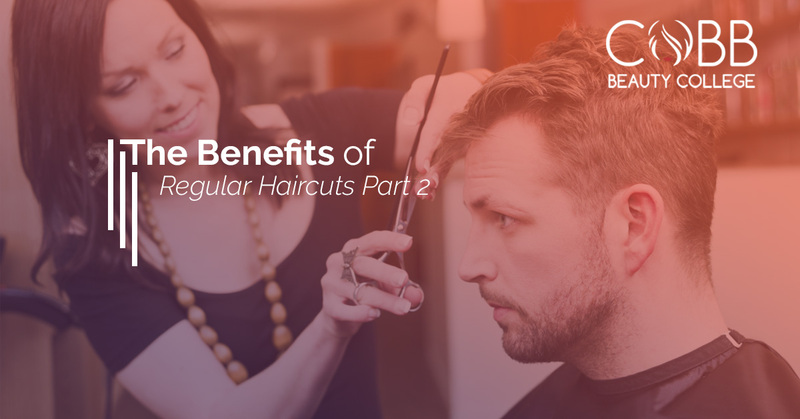 Although regular haircuts aren’t free, they keep your hair healthy, which is a lot more affordable to take care of in the long run. You don’t have to break the bank to get regular haircuts. As we already mentioned, regular haircuts could help you save more money on hair products, and when you take advantage of the beauty school services at Cobb Beauty College in Kennesaw, you’ll save a whole lot more on those haircuts too. Our basic, beauty school haircuts start out at just $5, and like all of our salon services, your haircut will be completed by an advanced student and supervised by a licensed instructor. Schedule your next haircut with Cobb Beauty College today!